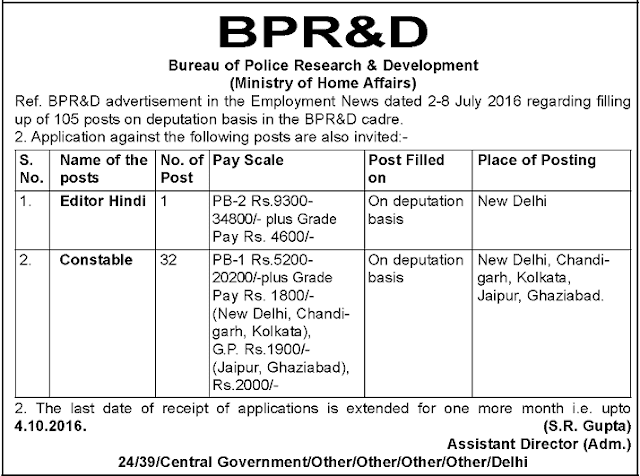 Bureau of Police Research & Development i.e BPRD, New Delhi is inviting to fill up the 138 various posts on Deputation Basis /Composite Method. The closing date for submission of application till 4th October 2016. The Government of India vide Resolution No.8/136/68-P.I (Pers.I) dated 28.08.1970 formally established the Bureau of Police Research and Development (BPRD), under the Ministry of Home Affairs giving a new orientation to then existing Police Research and Advisory Council. On deputation basis/ Deputation or Re-employment for Armed Forces Personnel. Not exceed 56 Years for all posts. The eligible candidate may apply till the last date. The last date of receipt of applications is extended for one more month.